This bookcase made for a job in Southampton, manufactured from Southern Yellow Pine, was made in three sections and assembled on site. The bookcase strips you can see enable you to maximise the storage capacity of the case. The shelves sit on feet that are inserted into the grooves on the strips, which are fitted into a machined rebate. This way they are unobtrusive and you get the maximum amount of storage from each shelf. There are two options available: chrome or brass. The case has birch-faced backs, which complement the pine nicely. Southern yellow pine is a superb species of timber from Oregon in the USA. I am able to obtain this in widths of 287mm (11 ½ “) and in thicknesses of 21, 27 and 33mm (7/8”, 1 1/8”, 1 ¼” ). Lengths up to 5 meters (16ft + ) are available. Southern yellow ‘Pinus Strobus’ is a straight grained timber that has a low shrinkage and very little movement, so it is not prone to cupping, that is turning up at the edges on wide boards. It’s used in pattern making, carving, drawing boards, high-class joinery and general interior carpentry. It is not suitable for exterior work in exposed areas or for boat building. This is a beautiful wood, the grain often displaying pronounced reddish-brown streaks on a pale straw background. This particular pontoon situated on the upper reaches of the river Itchen required the complete replacement of all timber components. This pontoon is a floating pontoon often referred to as a trot when sited in the middle of the river and tied to piles which are essentially steel pipes driven into the river bed by cradles at each end, thus allowing the pontoon itself to rise and fall with the tide. Constructed using four GRP (glass reinforced plastic) floats, these floats are tied together by steel girders bolted to them , then the timber work is fixed to these girders. As with previous pontoon work undertaken tanalised Redwood was used throughout with slip resistant decking, all fastenings are A2 or A4 stainless steel. 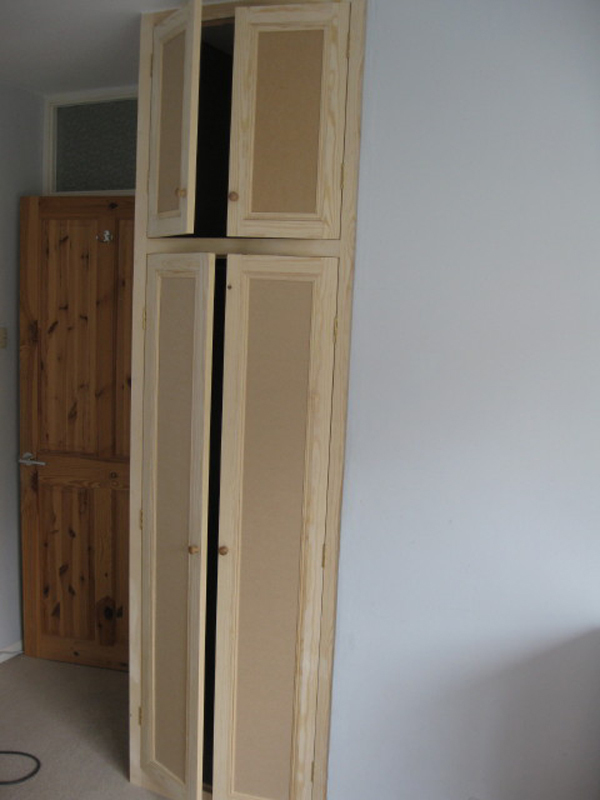 This particular wardrobe was purpose built to fit between a return in the bedroom and the bedroom door, narrower than usual finishing at 700mm wide from floor to ceiling with a four door configuration, this makes best use of the space available without dominating the room. The carcass is 18mm MDF with joinery grade pine fronts and doors. 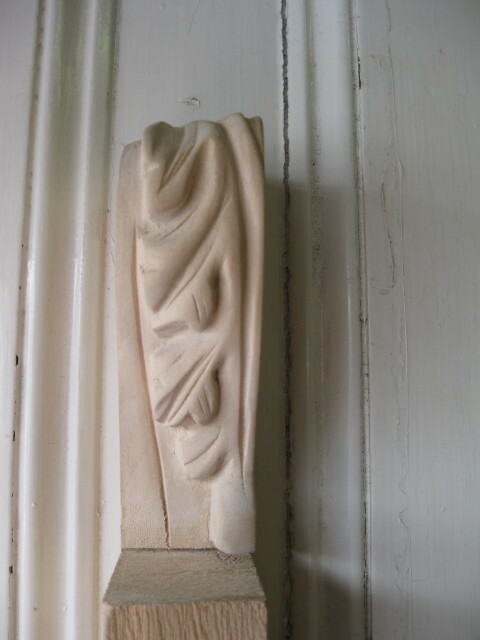 The original Newel Post was cut off many years ago, a common practice, often to make it easier to get large items of furniture upstairs. The problem with this particular ‘stub’ was that it had been cut at 45 degrees so the standard procedure of inserting a dowel would not have been sufficiently strong enough. I was reluctant to take the Newel out and start again as this would have required the bottom of the stair case to be opened up,so as well as two dowels, two splines were let in to enable the replacement newel to be fitted with confidence. Then the bottom cap and handrail were fitted once the glues were completly dry. The spindles are then cut to length and installed. All the components i machined from stock timber using a spindle moulder and router. It is important to have a solid newel as everything else depends on that, also it gets alot of stress put on it, If you have children, watch as they swing around the post using it as a fulcrum when comming down the stairs. The replacement of two posts to a porch showing the proping up of the canopy during relacement and the use of Hardwood pegs to prevent slip of the joint. I am often asked what’s the difference between Hardwood and Softwood and will Hardwood last longer? The first part of that question is fairly straight forward to answer; Hardwood is timber from broad-leaved usually deciduous trees, that is, a tree that looses its leaves each year and belongs to the botanical group angiosperms. Not all hardwoods are hard though, most British species are; exceptions that come to mind are Yew, classed as softwood but nearly as hard as Oak, and Larch, classed as softwood but in fact deciduous. Softwood is a timber mainly from conifers that is a tree that keeps its foliage or needles all year round and belong to the botanical group gymnosperms. But again exceptions do exist, Balsa wood classed as a hardwood is in fact the most soft of timbers. The second part of the question is not so easy to answer. You certainly would not construct a boat out of Redwood, but Larch a softwood is suitable, I once had a boat constructed out of Larch on Oak that is to say Larch planks on Oak ribs, and the yacht featured on this site was made with Pitch Pine a softwood and 90 years on it is still going strong, on the other hand, a boat constructed out of Sapelli a hardwood would not do at all. Conversely I have come across timber windows and doors constructed out of softwood that are well over a century old and suffering no adverse effects of rot or decay, and hardwood cills on conservatories maybe 15 years old and rotten through out. There is also aesthetics to consider. So what’s best? There are certain timbers that seem to be almost bullet proof to what ever situation Teak, Pitch Pine, Green Heart, Oak, four woods that will last, there are others, the first two mentioned are difficult to obtain and certainly very expensive the most readably available durable hardwood has to be Oak, and the most durable softwood that I know of is Pitch Pine. But the durability of more commonly used woods for exterior work comes down to the paint or stain used and the application of that paint or stain. Its no good giving a door or window that is new wood a coat of one coat gloss and expecting it to last as long as those mentioned earlier it has to be ‘ a built up layered system of paint’ that is primer x2 coats, undercoat x1 coat, and gloss x1. Or for stains at least 3 coats and a further 2 coats after a period of 6months. There after a 10 yr cycle of refurbishment of the paint system applied should suffice. 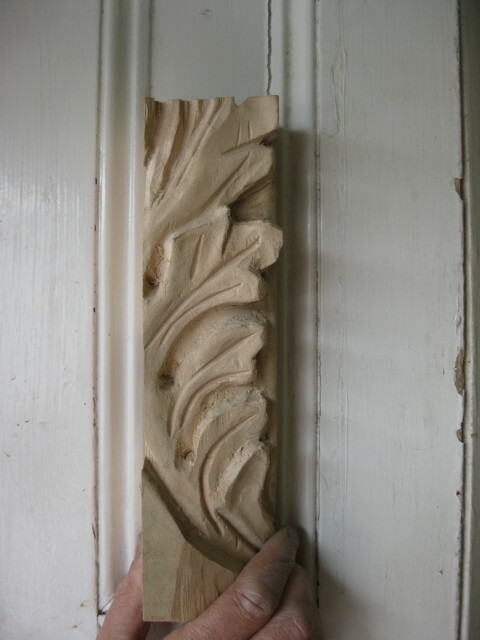 There are pre paint preservatives that can be applied, a clear wood preservative can be used, and for serious period joinery projects, circular joinery, or carvings the option of ‘vac vac’ or ‘double vac’ as it is sometimes called should be considered this is a clear pressure treatment of preservative that renders the timber rot proof for many years. So the conclusion is certain hardwoods are by far longer lasting but common softwoods i.e. : Redwood will last many years so long as the correct system of preservative/paint is used. 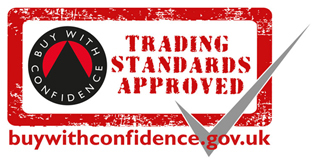 When you go to a timber merchant to buy your timber, please bear in mind that each merchant may be using different suppliers, so what’s available in one may not be available in another. Also, each can have a distinctive character about them; they are not, and thank god they are not, like the big DIY chains. The first impression might be the fact that the timber is lying flat, not stood on end. This is how wood should be stored. The next thing to notice is the range of sizes available. To begin with, lets assume that you want softwood with a smooth finish – that is timber that has already been planed on all four sides, known as faces, and referred to as PAR (planed all round) or PSE (planed square edged) or simply ‘prepared’ rather than ‘sawn’. At this stage bear in mind the following: if you order 50×100 (4” x2”) prepared, you will get 46×96. That is because all prepared timber is sold ‘Ex’ sometimes referred to as ‘Nominal’, which means the size it was sawn to before it was prepared. One other point to remember is that lengths are sold in multiples of 0.3 of a Meter so its 0.3, 0.6, 0.9, 1.2, 1.5, and so, on up to about 6 Meters. 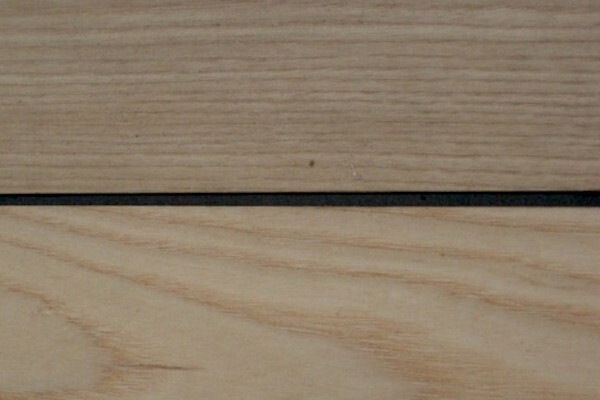 However, you may not be able to buy a minimal length of any given size as the timber merchant doesn’t want to be left with a 0.9 length after selling you the other piece that’s 2.1m, so you may have to buy the whole 3m length. 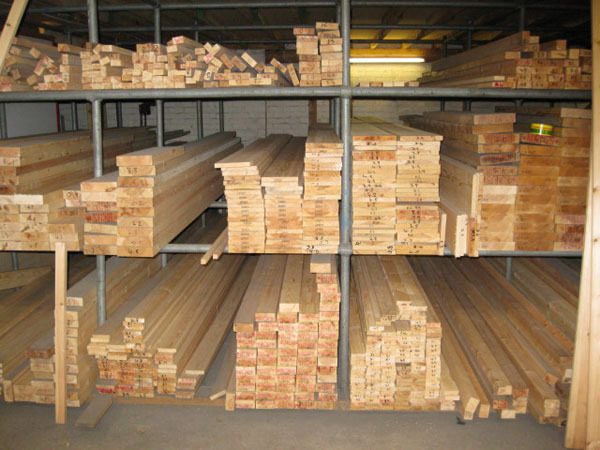 If your’e buying sawn, then the general rule is that you buy the whole length and they usually come in at 2.4m ,3m, 3.6m, 4.2m, 4.8m depending on the dimensions (width and thickness). Unless specified, sawn is usually 5th grade and unprepared, so if you ask for 50×100 you will get the full 50×100. Common hardwoods, that is Oak, Sapelli, Meranti, Ash and such like, also come prepared and sometimes sawn. Again, merchants may only sell you the whole length unless they can be left with a reasonable length that is sellable, so be prepared to pay for the off cut (the bit you won’t use but have to pay for and take away). Please also consider the issue of using timber that is not under threat from exploitation and does not have a vulnerable status. We may all wish to have fancy flooring or solid hardwood items, but there is a growing environmental cost. A most worthwhile campaign group and charity that protects native woodlands in the UK is the Woodland Trust, which aims both to preserve the threatened remains of our ancient forests, and to plant new forests and woods. Also, do please think about using reclaimed or recycled timber from reclamation yards and timber banks, or even skips. I once built a small kitchen from Pitch Pine found in a skip. 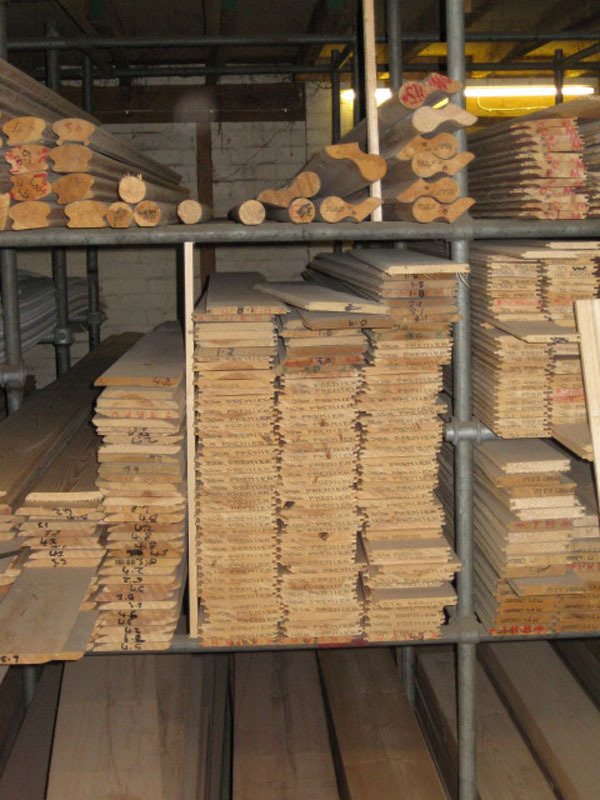 Southampton has a wood recycling project, and Friends of the Earth have a publication called The Good Wood Guide, which gives you information about using sustainable timber products and recycling. With the FSC (Forest Stewardship Council), all timber will now have a traceable chain from felling to the merchant, thus ensuring sustainability. This image shows the repair and replacement of the bottom portion of a supporting post to a porch. The method used is a 45 degree scarf with a timber key machined through to prevent slip of the joint in years to come . This type of rot is a common problem with posts. I also added a shoe around the bottom to prevent water penetrating and stop the post from rotting again.